This material first appeared in the I-CAR Advantage Online, which is published and distributed free of charge. I-CAR, the Inter-Industry Conference on Auto Collision Repair, is a not-for-profit international training organization that researches and develops quality technical education programs related to collision repair. To learn more about I-CAR, and to subscribe to the free publication, visit I-CAR Advantage Online. Several vehicle makers use aluminium. Many use aluminium for various exterior body panels, while on some vehicles, others use aluminium for the entire structure. Recently, new vehicles with more of a performance-based attitude have been introduced with aluminium used for the structure. Let’s look at the reasons why aluminium is used for designing these vehicles and at some of the vehicles. is lightweight. Lighter weight material can help contribute to quicker vehicle acceleration and shorter stopping distances. can be formed multiple ways for part construction. Aluminium also has excellent strength for being a lighter weight metal. Part of the strength bonus of aluminium is that it has high torsional rigidity, or more resistance to twisting. 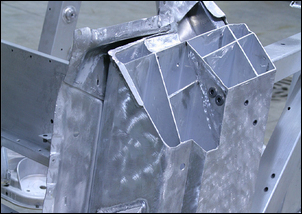 This quality is even further enhanced in a multi-celled aluminium extrusion. A multi-celled extrusion with inner reinforcements designed into the part greatly increases the strength and rigidity. This can contribute to better cornering stability and better wheel-to-road power distribution. 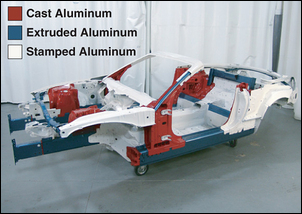 One of the main reasons for using aluminium in performance vehicles is safety. Performance vehicles are designed to perform at higher rates of speed, which may lead to more severe damage to the vehicle in the event of a collision. Aluminium is very predictable in the way it reacts to collision forces. Vehicle designers can use this predictability for designing vehicles that absorb collision energy and transfer collision energy around and away from the vehicle occupants. 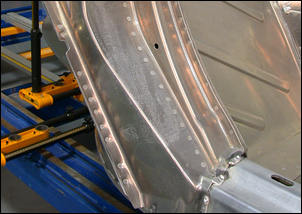 Certain vehicle parts, such as front crush tubes or single-cell, extruded lower rails are designed to compress and absorb collision energy, while larger, multi-celled extruded inner rockers will transfer collision energy around the occupants. There is one common thread with these types of designs. Parts that are damaged from a collision are often replaced to restore the structural integrity and safety of these vehicles. Audi released the new R8 with a space frame structure built of 69% extruded aluminium. Some of these extrusions are multi-celled, including a five-celled inner rocker and an eight-celled inner B-pillar (pictured). Different than previous Audi space frame vehicles, the R8 uses only six castings for construction. To streamline production, parts that would typically be made of cast aluminium are made from extruded 6000 series aluminium. The R8 has a 4.2 litre V8 engine, capable of producing 420 horsepower. The R8 engine uses a dry sump oil system with an external oil tank, similar to conventional race car applications, that holds 15 quarts of engine oil. The R8 structure is primarily GMA (MIG) welded together, but does use some rivet-bonding and threaded fasteners for joining. 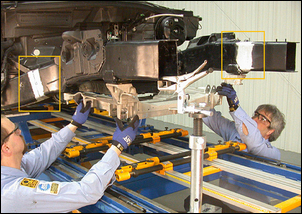 Audi has complete front and rear structural assemblies available for collision damage repairs. 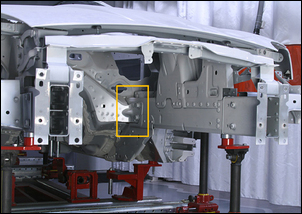 When replacing damaged structural parts, the factory joining method is typically duplicated. 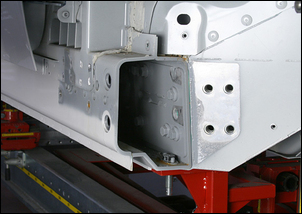 Welded sectioning is only allowed in a few areas, such as the outer A-pillar, the outer rocker panel, and select extruded parts pointed out in the body repair manual. All sectioning joints are made using inserts. All welding is done using GMA (MIG) welding using pulsed-spray arc transfer. Also noteworthy, Audi uses an aluminium/steel hybrid structure for the 2007- current TT coupe and roadster. Jaguar Cars released the redesigned XK with a new aluminium-intensive structure, replacing the outgoing steel unibody design. The new advanced monocoque construction of the XK consists of twice as many castings as the Jaguar flagship model, the XJ sedan, and three times the extruded parts. The use of more castings and extrusions led to building a vehicle with a more torsionally rigid structure, with fewer parts. The rocker panels are an open extrusion design, which makes them a C-channel shape with mating flanges. The XK uses a combination of 5000 and 6000 series aluminium, similar to the current XJ design. The XK has two engine options available, a 4.2 litre V8 capable of 300 horsepower, or a 4.2 litre supercharged V8 capable of 420 horsepower. The XK is also available as a coupe or a convertible body style. The XK has a unique structural design, which mostly uses rivet bonding and threaded fasteners for joining. The front structure has a bolted-on front crush tube for low speed impacts. If damage transfers past the front crush tube, the lower front rail is also attached with bolts near the cowl (pictured). Other than threaded connections, the XK coupes and convertible use mostly rivet bonding for part replacement procedures, while limiting the amount of welding and sectioning. Rivets used for repairs include self-piercing rivets, blind rivets, and monobolts. 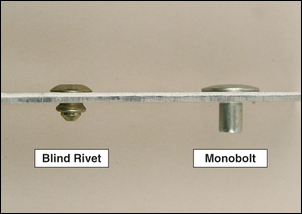 Monobolts differ from blind rivets in that rather than compressing the rivet body down onto the backside panel, the stem of the monobolt flares the body out, creating a wedge effect. The Corvette Z06 uses an aluminium frame that consists of two 6000 series extruded main side rails, final shaped using a hydroforming process. The main side rails measure 4 mm thick in most locations. 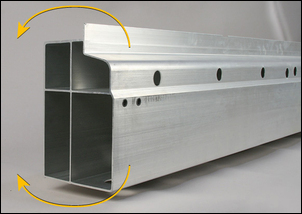 Extrusions are also used for bumper reinforcements, A-pillars, and the roof reinforcement bar. Stamped aluminium is used for B-pillar construction, inner floor, and tunnel construction. Castings are used for front and rear suspension-mounting locations. The Z06 comes with a 7.0 litre V8 engine, capable of producing 505 horsepower. The Z06 also uses a dry sump oil system. 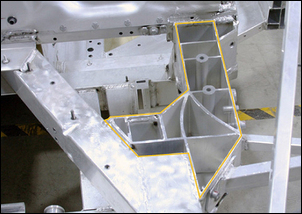 The Z06 aluminium structure is primarily GMA (MIG) welded. Self-piercing rivets are used for assembling some stamped pieces together, for example the B-pillar. 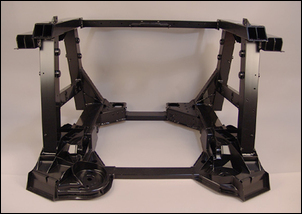 The Z06 side frame rails can be sectioned in five locations. General Motors recommends that Z06 repairs involving GMA (MIG) aluminium welding be done using pulsed-spray arc welding equipment. While the vehicles mentioned may have differences in structural design, they all share one common denominator. Using aluminium for vehicles capable of high performance is intended to maximize vehicle potential, while also keeping the occupants safe if a collision takes place.